Whooop, it's finally here! My favourite month of the year! I'm so excited for all the festive posts I have planned. I have a total of SEVEN gift guides coming up and this is my very first one... I hope you like it! Receiving a tailored hamper as a gift can be one of the most thoughtful of presents. It shows that time and consideration have been taken and is ideal for the person you know will appreciate that! Here I've come up with two hampers with two budgets - under £10 and £20. Both of these are quite low amounts but as my blog is all about being savvy I thought I'd challenge myself to create two quality hampers on a budget. I've also created a free download that you can see in the above image to print out and frame if you wish; to give as an individual gift or as part of a hamper or even just to keep for yourself. I really hope you like it! Anyway, on to the hampers! The Cosy Hamper is cosy! 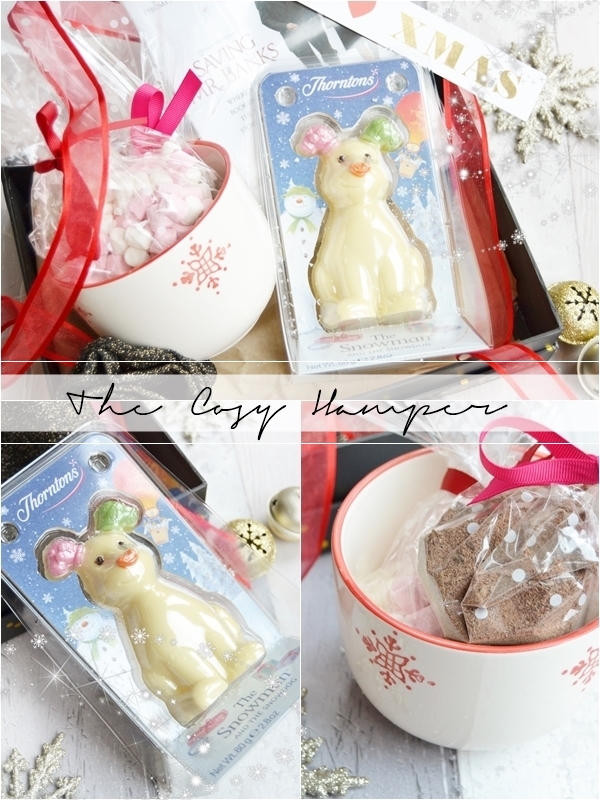 Full of little treats the recipient can enjoy this winter, think all things yummy and cosy. With only a £10 spend you really are going to have to get savvy here but I found I managed to pick up 5/6 items that were of great quality and really complimented each other. Included in the cosy hamper - Saving Mr. Banks (Tesco £3), Thorntons The Snowdog White Chocolate Model (Thorntons £3.50 here on 3 for 2), Black Glitter Thread Socks (Tesco £2), Large Festive Mug (£1 Pound World), DIY mini marshmallows & hot chocolate (or you could pick up a chocolate share bag for £1 at Asda/Tesco). My favourite item here has to be the lovely Snowdog chocolate, this is a good size and just so cute, plus everyone knows that Thorntons only do good quality chocolate! But I also really feel a good DVD that suits the person you are gifting is a lovely inexpensive treat. I personally LOVE Saving Mr. Banks and think it's a great cosy night in watch. I'm also really pleased at finding such a lovely mug in Pound World, in fact they had quite a few festive ones in fair isle print. As for the little DIY pouches of mini marshmallows and hot chocolate I bought cheap dotted cellophane from eBay here (also great for wrapping the whole hamper in!) and tied them in little pouches using some ribbon I had lying around (okay, now I'm starting to sound like Kirstie Allsopp, apologies!). Overall I think this is a lovely thoughtful looking gift that I'm sure most people would be pleased to receive. The Beauty Lover Hamper is just that... a hamper full of beauty treats... 9 of them in fact! Again I wanted to only include good quality products in this hamper as if you're a beauty lover makeup from Pound World just wouldn't cut it. This really took some thinking but with the personal touches in the framed print and the alphabet makeup bag I think I've managed to pull together quite a nice hamper here... well I know I'd love to receive this come Christmas day! Included in the beauty lover hamper - Beauty Quote Print (download for free here), Alphabet makeup bag (Matalan £4), Soap & Glory minis (£5 on 3 for 2 at Boots), 2 Essie Nail Polishes (Fragrance Direct £2.49 each here), Montagne Juenesse Face Mask (Superdrug £1), MUA Eyeshadow Undressed Palette (Superdrug £4). 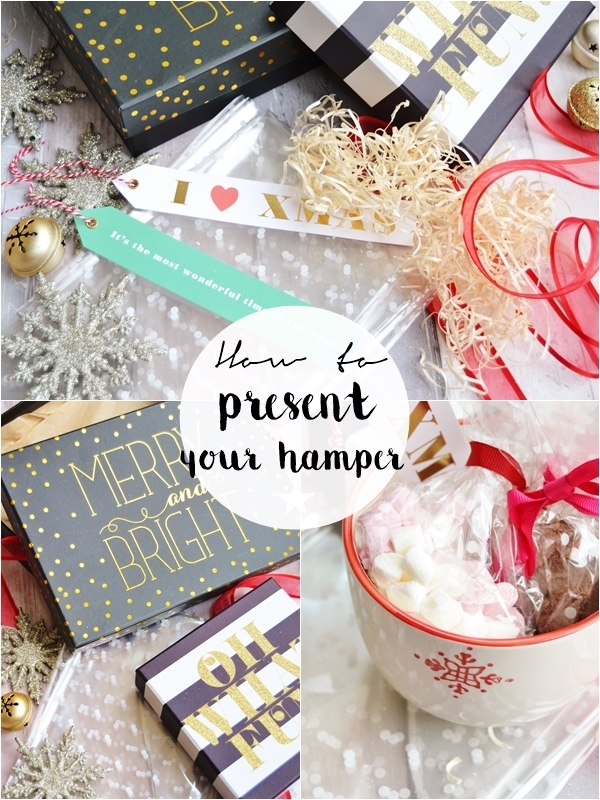 Of course I'm biased here but my favourite part of this hamper is the quote print! Any kind of framed print can be pricey so I decided to make my own and I really love the results! As for the frame you can find plastic ornate style frames in various sizes and colours from Pound World but I highly recommend looking in Asda for plain white frames for under £2. I also think both the Essie nail polishes and Alphabet makeup bag are excellent value for money and perfect for a beauty lover. As for bulking up the hamper I decided to pick up 3 Soap & Glory minis and was actually surprised at the selection Boots had on the 3 for 2 offer. I also had to include one of my favourite budget eyeshadows palettes with the MUA Undressed palette which is packed full of shimmery pigmented neutral shades. 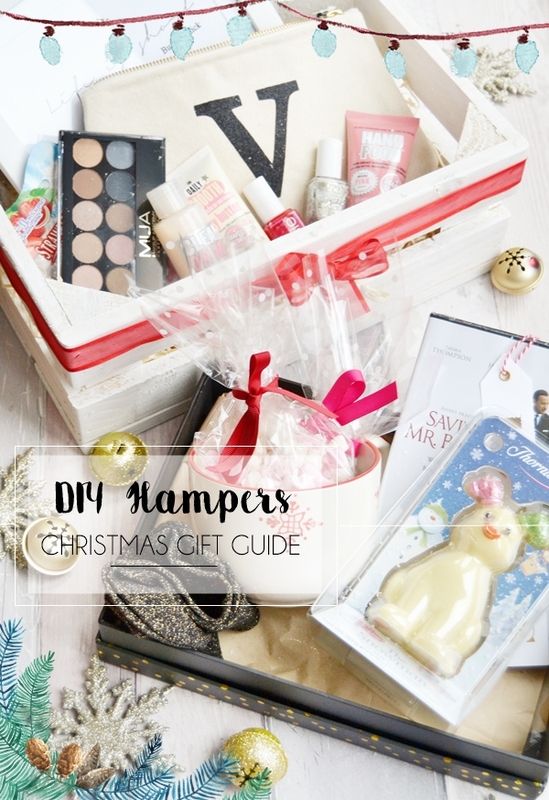 Once you've purchased all your hamper goodies it can be tricky deciding on how to present it as a whole. If you are on a total budget then re-using a cardboard box and wrapping it in brown paper or wrapping paper is your best option. But if you want to spend a few pounds on a nice box then I'd totally recommend looking in either TK Maxx or Homesense as they have tons of gift boxes in all shapes and sizes starting from as little as £2. For filling the bottom of your hamper shredded tissue paper works the best and looks the nicest in my opinion (eBay has tons of the stuff in a different colours) or if you have a few beauty boxes then using the paper sizzle from them will save you money. To wrap up the whole hamper I'd personally suggest using clear florist wrap/cellophane which is how you see most hampers wrapped up. I picked up a metre length of the white dot cellophane for only £1.79 on eBay here but of course bigger rolls are available. Then I'd finish off the hamper with a gift tag and a nice ribbon. I really hope you enjoyed reading this post and can also make use of my downloadable beauty quote print!